WE SURVIVED the week!! I am still reeling from the craziness of it all! How was your week? I spent Monday and Tuesday prepping for an event and school starting soon and Wednesday pretty much laid out sick in bed trying to keep four kids alive while moving as little as possible. Thursday I tried to pretend I wasn't feeling bad and we went to a local amusement park and I paid for that on Friday. As you can imagine, things got a little crazy. I spent a lot of time playing "fetch" with the toddler (ie. I threw a toy/ball and she got it and brought it back to me) and letting her empty pretty much every drawer in my kitchen. We did a lot of shoe fashion shows too. The big kids just watched movies on repeat. By Friday the kids were fighting a lot and we were dealing with some challenging behaviors. Boredom can do that to you. Toddlers obviously aren't the only ones who can be hard (in our family the 4-year-old is typically the hardest), so we needed to do a little reset and review some positive behavior strategies. Since we were reviewing them, I thought I'd share a few of my favorite resources for dealing with challenging behaviors with YOU this week! Here are 5 of the biggest behavior issues at our house over the past few years (and week)... and my favorite resources for dealing with them!! When my kids don't listen it drives me crazy. Usually I am partially to blame, but it KILLS me anyway. These three strategies from Amanda Morgan to help kids listen are super simple (and ones we know), but ones I have to remind myself about CONSTANTLY. I also loves these games for helping kids practice listening shared by Katie at Playing with Words 365. When kids hit me or each other it is so frustrating. Today my 4-year-old kept hitting me in line at the store. I tried to stay patient and follow all of the tips that I KNOW that I've shared in this post about helping toddlers who hit but then I just lost it and yelled at him when we got back to the car! Grr. Tomorrow I will be practicing more patience and trying harder! I've also been watching this free Angry Mom to Peaceful Home video series that has been helping too. Toddlers (or older kids) that run away from you (or run into traffic or hide in stores) can be so frustrating! A lot of these tips for stopping toddlers from running away have helped us. I especially love this Daniel Tiger episode/song. 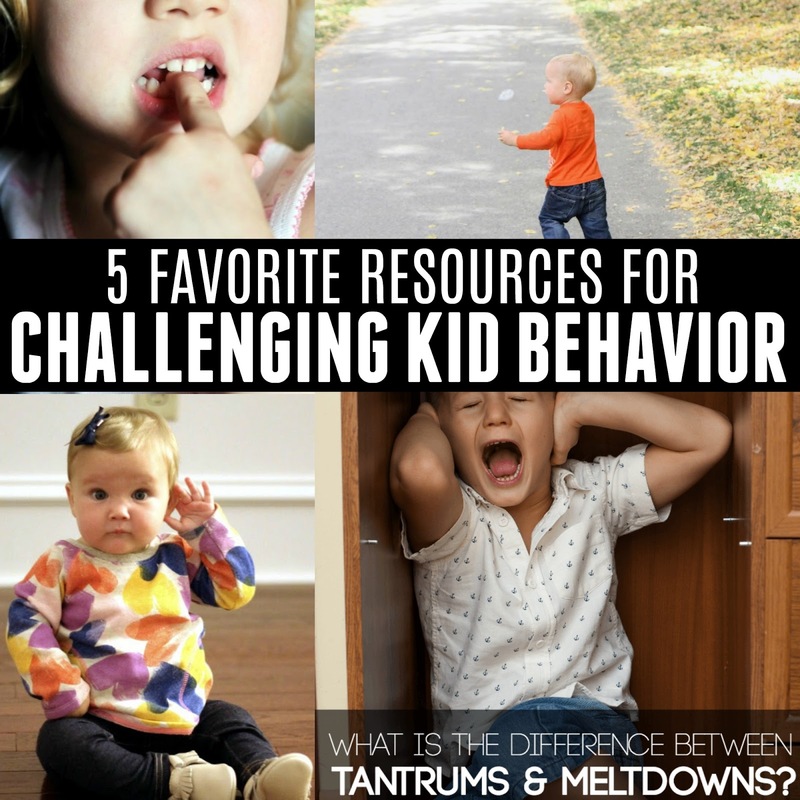 Tantrums are different from meltdowns, so it is important to distinguish which one is happening. 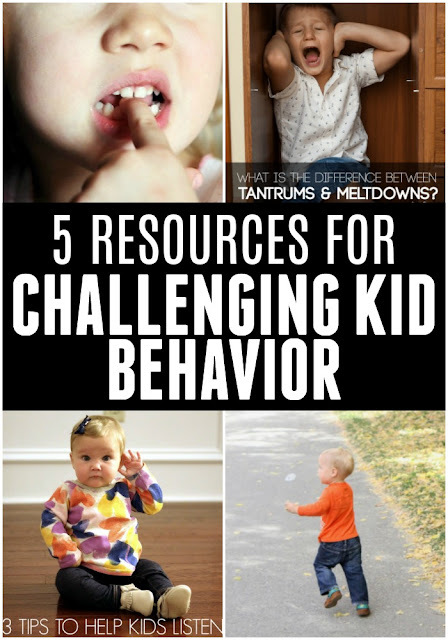 Tantrums typically include manipulation, knowing what they are doing and a choice while a meltdown includes being overwhelmed, anxious feelings, and system breakdowns. (My friend Dayna breaks them both down really well in her post The Real Difference Between a Tantrum and a Meltdown). Acknowledgement of the child's emotions is the first step we usually take when a kid starts having a tantrum. Sometimes that stops it before it spirals out of control. You can read more about it in our favorite tip for dealing with tantrums post. One of my kids has gone through a biting stage and it is awful! This post about biting over at Happy Hooligans is my favorite resource on the topic. There are tons of different ideas to try!!! If one has worked for you, please share it! Do you have any other challenging kid behaviors going on at your house right now? ?